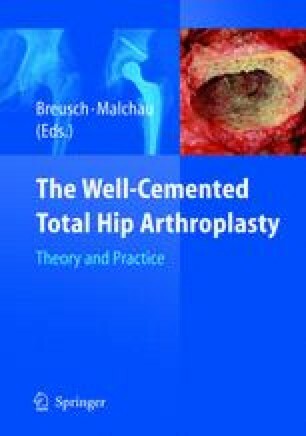 This chapter describes the interface between bone cement and bone, pointing out that the operating surgeon is responsible for establishing that interface at the time of surgery. If the interface is not well established at the start, the replacement joint has no chance of long-term function. The cement-bone interface is a mechanical interlock between the two materials that can be enhanced by the preparation of the bone surface, pressurising cement into that surface and holding the cement under pressure until its viscosity is such that bone bleeding cannot displace it. Effective pressurisation can only be obtained using suitable instruments. The effect of heating the femoral stem before insertion is described. The surgeon has to be aware of the effect of all the variables in order that the strongest possible interface is obtained at the time of surgery.